"Poop on people from on top of a tall building!" Have you ever dreamed of pooping on people from a great height? perhaps not, but clearly the developers of Muddy Heights have! Muddy Heights is a surreal game in which you play a man sat a top a tall building clearly in some kind bowel related distress who has decided to unload himself on the unsuspecting and busy street below. 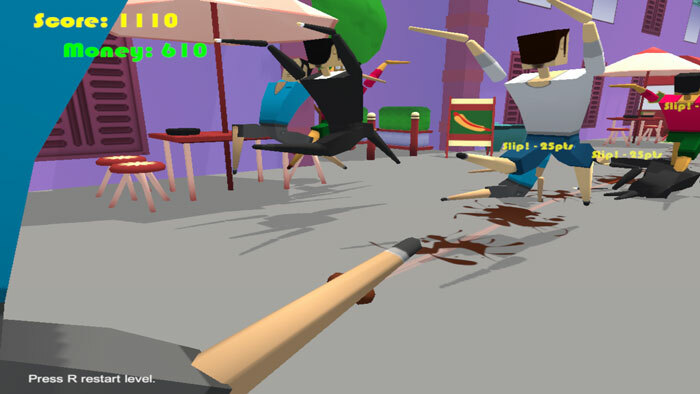 You gain points by hitting people and traffic with your poop, if you cause people to slip or cars to crash you will also gain even more points, these points can then be used as money to buy food to increase certain aspects of your poop such as to make bigger, more slippery or more runny and be able to hit more victims with it as it falls. Whilst the premise of the game is pretty gross and the graphics are fairly simple and some what blocky it is kind of fun and you will soon find yourself taking poop after poop to try and beat your previous score, you can also control the direction of your poop using the W A S and D keys to try and hit more targets in one "shot". Move your poop around in the air and try to control it as it falls so as to hit as many vehicles and people as possible, obviously people give you the highest pints so try to get as many of them as you can. The more you poop the more money you will make to spend on poop enhancing items to try and get a higher points total! Whilst there isn’t too much longevity in a game like this as it does tend to get repetitive quite quickly it is silly and good fun and probably would be a big novelty hit if you have a few friends over. It’s a free to play download and definitely will give you a little giggle!